Create an infographic that highlights the international student population of Kent State University. 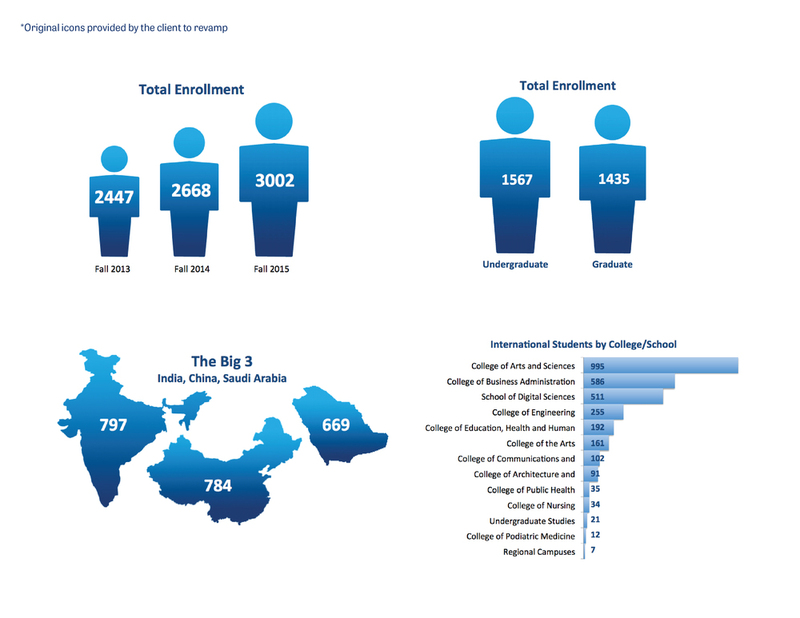 The infographic should guide the viewer through the international experience, and promote all of the ways Kent State makes itself "Ohio's International University." This particular project started out very small, and continued to grow the more I worked on it with the client. At the very beginning stages, the client asked that I clean up and revamp their old icons. After that initial stage, they decided they wanted something even more expansive. As I continued to deliver them more detailed materials, the project continued to grow into something more extensive and engaging. As shown below, the initial designs were very simple, refined and scholarly. I stuck strictly to the Kent State color scheme and used neutral stylized icons. However, as the project began to expand, the client and I decided to take it in a new, more exciting direction with engaging illustrations, a less limited color palette and a wider array of typefaces.